Amanda is heartbroken. She's tried, but she can't get over her breakup with hotshot writer Harry Gordon. If only she could talk to him, she could convince him that their love story is bigger than any screenplay. But Amanda isn't the only one in Hollywood keeping a secret—Harry's got one too. Margo has to pinch herself: there's talk of her getting an Oscar nom for her first film role, and she's living with the Dane Forrest, the gorgeous movie star millions—including herself—swoon over. But if the public finds out about their domestic arrangement, her career will be over. The studio has a plan to fix it all . . . but is Margo prepared to pay the price? Gabby's drinking is out of control, but who cares? She's bored and depressed. She needs someone who will treat her like the woman she is beneath the silly stage costumes and pigtails. And she's sure unpredictable musician Eddie Sharp is The One. But playing with bad boys like Eddie isn't for little girls. . . .
RACHEL SHUKERT has been fascinated by the Golden Age of Hollywood since she was a little girl, when she used to stay up all night watching old movies and fall asleep the next day at school. Rachel grew up in Omaha, Nebraska, and graduated from New York University. She is the author of Everything Is Going to Be Great, Have You No Shame?, and the Starstruck novels. She lives in Los Angeles with her husband. 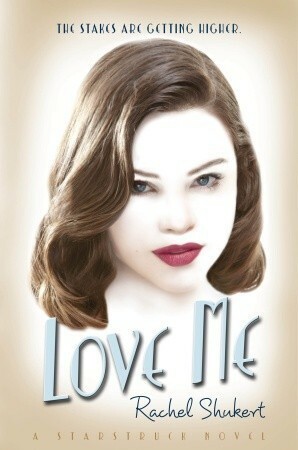 Love me picks up right after Starstruck ended in the Hollywood 1930's setting. I think this setting is perfect for the story. There is a plot twist that was introduced but not really elaborated on that much, leaving room for a plot hole. I liked that the characters grew and developed from the first book. I was able to sympathize with some of the issues Gabby was facing. This book was a pretty quick read for anyone wanting to read a historical fiction with some drama.